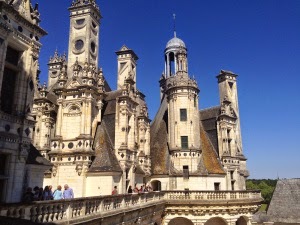 (Monday, May 19, 2014) We departed Paris promptly at 8am and arrived at the castle of Chambord around 10:15. Everyone was awestruck at the grandeur of the “hunting palace of the kings” with more than 400 rooms. After touring Chambord, we drove a short 15 minutes to the town of Blois where we had time for lunch and witnessing the amazing mechanical dragons that emerge from the Hudini building on the square of the Chateau. 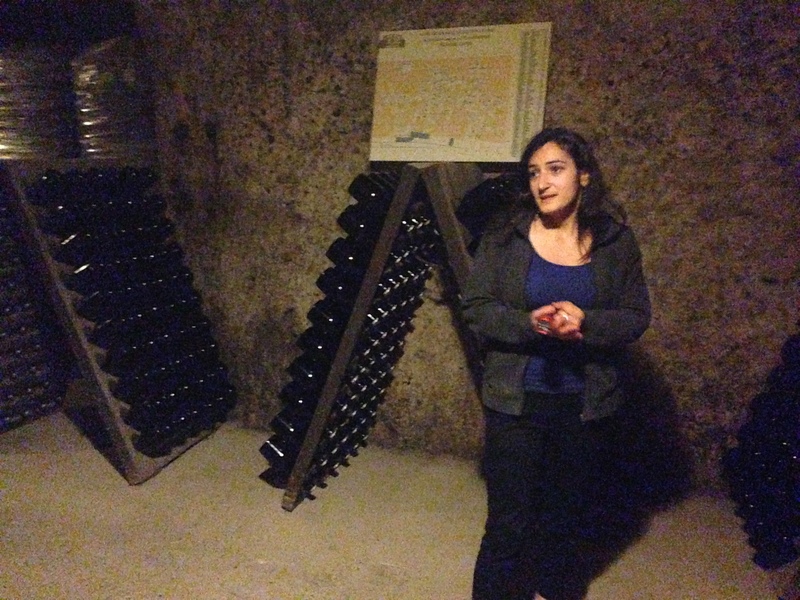 Next we drove about 40 minutes to the charming village of Vouvray where we had an appointment for a tour and tasting at the Caves de Vouvray. This is a large cooperative with 35 winegrowers, producing around 416,000 cases of Chenin blanc wine per year, with 90% of it being sparkling (cremant). We were quite impressed with the 2.5 miles of “tufa caves” where the wine is stored, and enjoyed the clear explanation of the winemaking process. All the cremants are made in the traditional method with primary fermentation and aging in stainless steel tanks for 6 months, then secondary fermentation in bottle, but only for 1 year. We were surprised to learn that they still hand-riddle (3 week process) more than 50% of the wine and use gyro-palates for the rest (one week process). Amazingly they charge the same price for both types of bottles, and admit there is no quality difference. We could only surmise they must have some good riddlers that they want to keep employed. Here we received the best explanation for the difference in the terms “Petillant” which is sparkling wine produced with less bubbles because less yeast and sugar is added to the bottle; whereas “Mousseux, which has double the number of bubbles (more similar to Champagne) has more yeast and sugar added to the bottle. We were told this winery specializes in the production of Petillant Chenin Blanc wine. This large coop only exports 10% of the production, and sell the rest via their tasting room, trade shows, and through other wine channels in France. 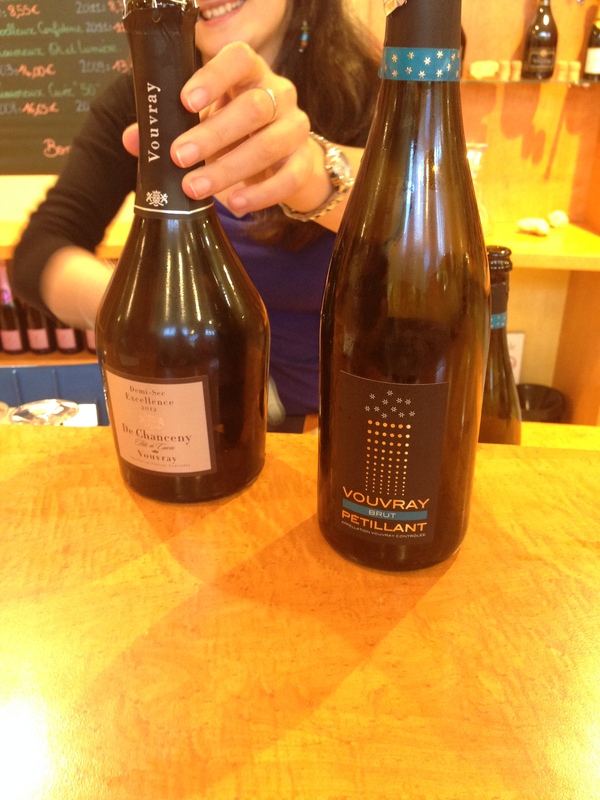 Back in the tasting room we had a delicious tasting of 4 of their wines, and were able to experience the difference in bubbles and mouth feel between the sparkling Chenin blanc “Petillant” vs. “Mousseux,” with the latter definitely having more bubbles than the former. The tasting room was large with an excellent selection and very reasonable prices. Everyone stocked up on Loire Valley chenin’s, cab francs, roses, and sparklings for only $5 to $7 euros per bottle!